She was the kind of cover girl for which universities drool. Attractive, sure, when she graced the cover of DePauw Magazine 25 years ago. But that wasn’t the point. 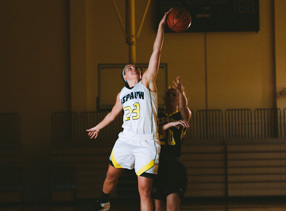 Erin O’Brien was an academic superstar who had been courted by any number of undergraduate institutions but who chose to attend DePauw University. A Rector Scholarship “sealed the deal for me,” she says. To be sure, winning a full ride to DePauw was a big deal for O’Brien when she was a high schooler and prospective science major. But it was only later that she realized just how big a deal it was. Indeed, the Rector Scholarship program, celebrating its centennial this year, has been a transformational program for individuals, for an institution, for the world. 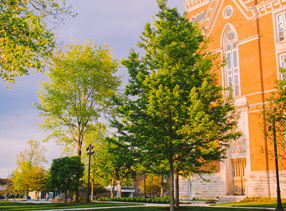 O’Brien, a 1996 graduate, is one of more than 4,000 people to win a Rector over the century since Edward and Lucy Rowland Rector established an endowment to attract bright students to DePauw. 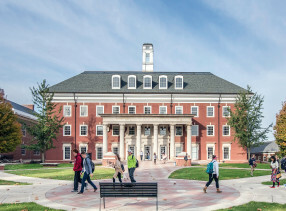 The scholarship has played a role in the success stories of and the enormous contributions to the world made by DePauw graduates such as O’Brien, who is a rhinologist at one of the leading medical facilities in the country; astronaut and physicist Joseph P. Allen IV ’59; former U.S. Rep. Lee Hamilton ’52, an expert on international affairs who won the Presidential Medal of Freedom; and Nobel Prize winner Ferid Murad ’58, a physician and Ph.D. pharmacologist whose work has saved the lives of premature babies and cancer and heart patients and inspired 160,000 publications that build on his discoveries. It paved the way for Douglas Hallward-Driemeier ’89 to become a Rhodes Scholar and a lawyer who successfully argued before the U.S. Supreme Court that gays should be allowed to marry; for Anne Nichols ’33 and James Johnson ’36 to become physicians and open a family clinic in Greencastle; for Bill Rasmussen ’54 to found ESPN; for Michael Akinbola ’09 to earn a doctorate and work as assistant athletic trainer and physical therapist for the Super Bowl LIII champion New England Patriots football team; and for Samantha Anderson ’14 to study for her doctorate in biochemistry. 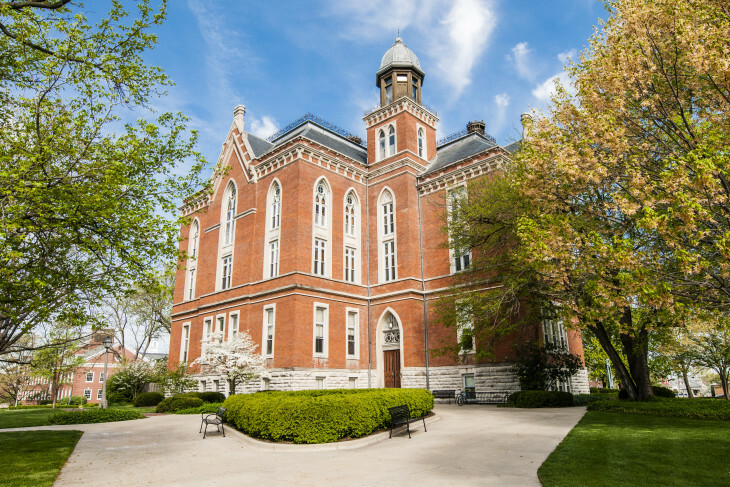 And, coming at a time when DePauw’s academics were shaky and its male enrollment was struggling, the Rectors’ gift ensured the university would become a premier institution known for its rigorous academics. During her first year at DePauw, O’Brien, already interested in science, started thinking that perhaps she’d like to become a physician. Graduating without debt made it less intimidating to look out of state at the best schools in the country, she says, and she landed at one, the University of Pittsburgh. 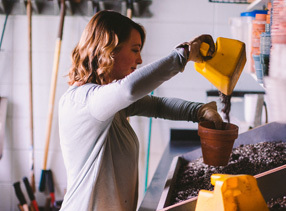 O’Brien had spent four years in DePauw’s Science Research Fellows Program, which enabled her to do research in her first year, an opportunity rarely equaled at most undergraduate institutions. In her senior year, she spent a semester at a laboratory affiliated with Harvard Medical School, working under DePauw alumnus Dr. W. Allan Walker ’59, also a Rector scholar. 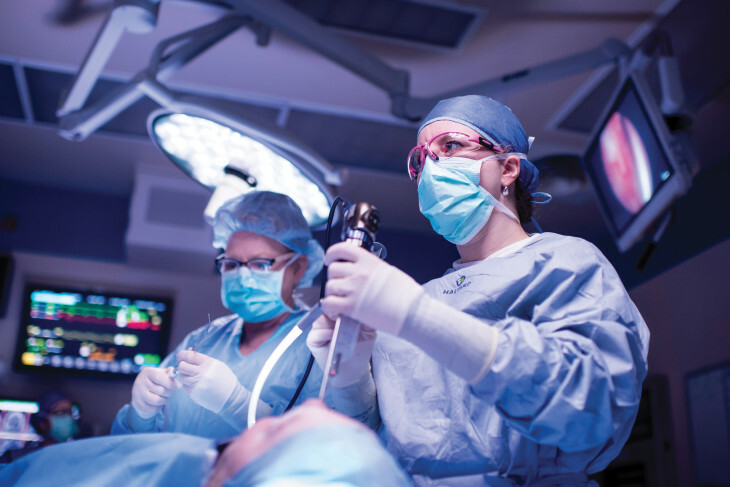 She knew early on that she wanted to perform surgery, and rotations in medical school persuaded her to choose otolaryngology. “I thought the anatomy and the diseases were the most fascinating in the head and neck,” she says. 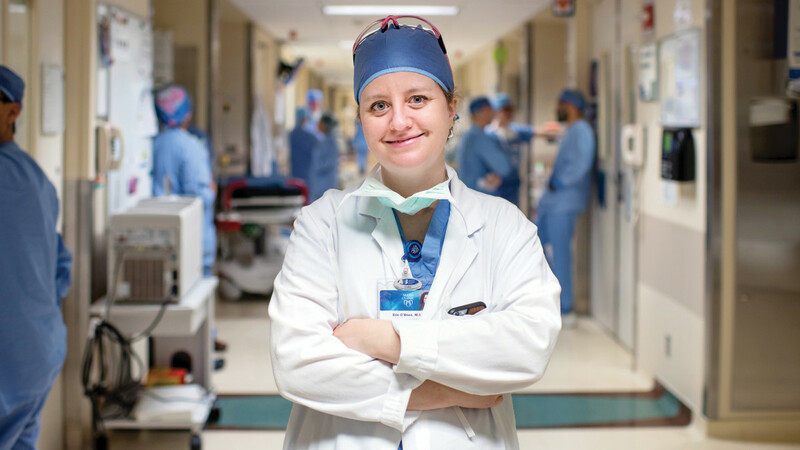 She took extra training to specialize as a rhinologist who treats sinus diseases and works with neurosurgeons to remove brain tumors through the nose. O’Brien also wanted to continue research. She has spent about 10 percent of her time doing it but that time soon will double, thanks to a contribution from a grateful patient. On a road trip maybe 15 years after graduation, O’Brien told her husband, a Big 10 graduate, that she wanted to stop by Greencastle to visit her professors. He incredulously asked how she expected them to remember her. “Of course they’re going to know who I am,” she recalls telling him. Earns an M.D. from the University of Pittsburgh School of Medicine. Interns in general surgery at Mercy Hospital, Pittsburgh. Serves a residency at the University of Iowa. Serves a rhinology and chemosensory fellowship at the University of Nebraska Medical Center. His father Joseph P. Allen III ’30; his mother Harriet Taylor Allen ’28; his paternal grandparents; an aunt; and two cousins had attended DePauw before him. His brother David T. Allen ’61; two cousins, Blanche Hester Wicke ’67 and F. Allen Hester ’69; and a nephew would follow. It was no surprise, then, that Joe Allen ’59 would choose DePauw, from where his future wife, Bonnie Jo Darling ’61, also graduated. The surprise would come much later, in the form of an unexpected, but stellar, career. Allen came to DePauw with plans to become a physics professor, and that’s the pathway he followed. 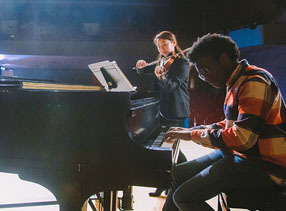 He earned master’s and doctoral degrees from Yale University and taught there for several years and for a year in Germany as a Fulbright scholar. He was working in the nuclear physics laboratory at the University of Washington when a newspaper advertisement caught his eye. The National Aeronautics and Space Administration was looking for astronauts, an occupation that he says he couldn’t have contemplated as a DePauw student; it had just come into existence the year of his graduation. He applied and in August 1967 NASA chose 11 men, including Allen, for its second group of scientist-astronauts. Allen learned to fly and served in earthbound mission control for the Apollo 15 lunar landing in 1971 and, a year later, for Apollo 17, the last mission to land men on the moon. He then took several administrative positions for NASA, including assistant administrator for legislative affairs in Washington D.C., before returning to the Lyndon B. Johnson Space Center in Houston in 1981 to support Columbia on the first space shuttle mission. He was tapped in 1982 to be a mission specialist aboard Columbia, from where he and the other mission specialist deployed two commercial communications satellites. 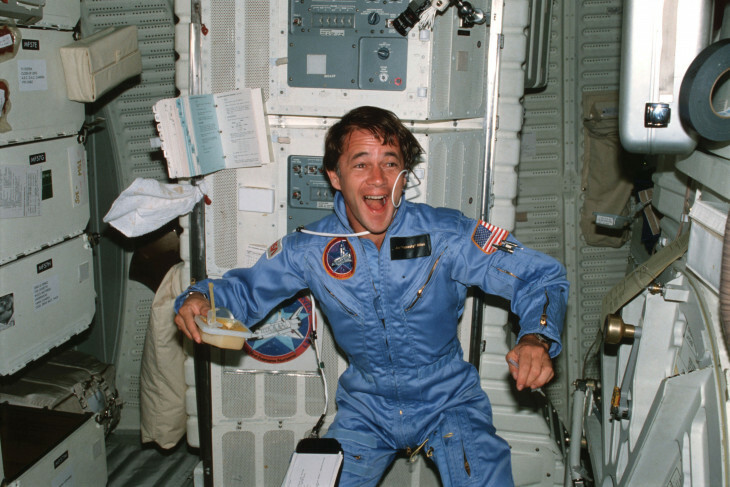 He flew again two years later as a mission specialist aboard Discovery. 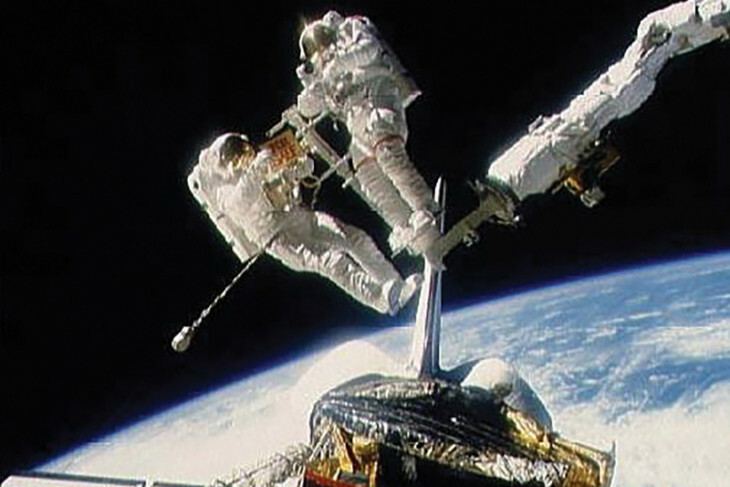 He and commander Dale Gardner deployed two more satellites and flew in space using untethered, Buck Rogers-style jetpacks to wrangle two wayward satellites the size of a Volkswagen Beetle – though they felt weightless – and stow them aboard the shuttle. “I’m extremely lucky,” Allen says. “It was quite a dangerous job.” In fact, the jetpack was deemed too risky after that flight and never used again. Allen left NASA in 1985 to become chief executive officer of Space Industries International Inc. and later chairman of Veridian Corp. In 2005, a year after he retired, he was inducted into the U.S. Astronaut Hall of Fame and received the Old Gold Goblet from DePauw. 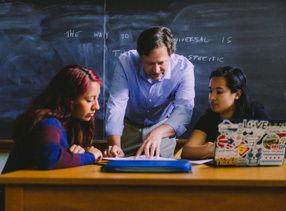 Teaches in Germany as a Fulbright scholar. Earns a master’s degree, then a doctorate in physics from Yale University. Works as a guest research associate at the Brookhaven National Laboratory; a staff physicist at the Nuclear Structure Laboratory at Yale; and a research associate at the Nuclear Physics Laboratory at the University of Washington. Becomes a scientist-astronaut at NASA; works as NASA assistant administrator for legislative affairs and later as director of astronaut training and operations; serves as mission controller for Apollo 15 and Apollo 17 and for the first test flight of the space shuttle. Flies in space as a mission specialist on Columbia for the first fully operational flight of the shuttle transportation system. Uses an untethered jetpack to retrieve a stranded satellite as a mission specialist on Discovery. Works as CEO of Space Industries International Inc. and chairman for Veridian Corp. and the nonprofit Challenger Center for Space Science Education. Is inducted into the U.S. Astronaut Hall of Fame. 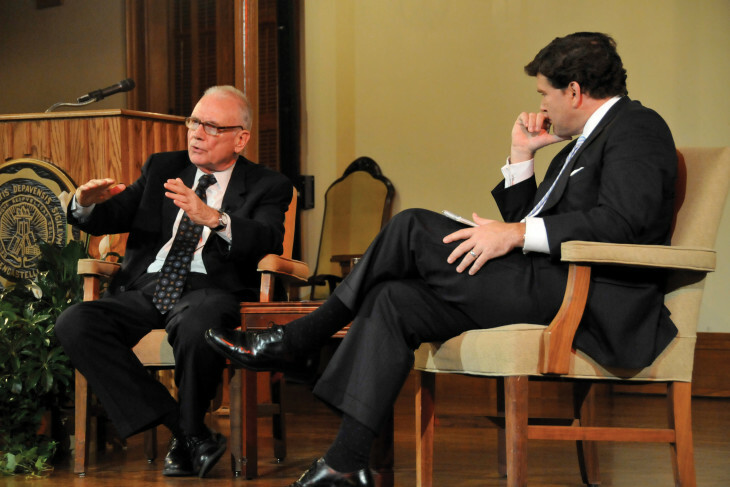 You might call Lee Hamilton ’52 a late bloomer. He came home to attend law school at Indiana University in Bloomington and then spent a few years practicing law in Chicago before moving to Columbus, Ind., to practice county-seat law. “I decided I didn’t have the passion or the enthusiasm for law that I should have,” he says. “I was more interested in international affairs. I asked myself, how could I impact policy? Policy was my interest, not politics.” He ran for Congress as a Democrat in 1964, when Lyndon B. Johnson’s landslide victory swept Democrats into office across the country. Hamilton represented southeastern Indiana for 34 years, gaining a global reputation for his copious knowledge and measured approach. He served, among other positions, as chairman of the House Foreign Affairs and Intelligence committees. Former U.S. Sen. Richard Lugar of Indiana, whose acumen in foreign affairs is equally renowned, says “some of the most important and satisfying days I enjoyed” in the Senate were working with Hamilton. Hamilton’s public service continued after his retirement from Congress, when he served on numerous ad hoc commissions, including the 9/11 Commission; the U.S. Commission on National Security in the 21st Century; the Iraq Study Group; the Baker-Hamilton Commission to Investigate Certain Security Issues at Los Alamos; and the Blue Ribbon Commission on America’s Nuclear Future. He also worked more than 10 years as director of the Woodrow Wilson International Center for Scholars. He founded and directed the Center on Congress at Indiana University and continues to work six days a week (though he owns up to long lunch periods) at IU as a senior adviser to its Center on Representative Government, a distinguished scholar in the School of Global and International Studies and a professor of practice in the Paul H. O’Neill School of Public and Environmental Affairs. In 2015, President Obama awarded him the Presidential Medal of Freedom, the country’s highest civilian award. 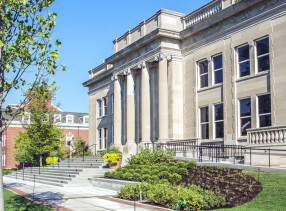 Neither he nor his brother, the retired pastor of North United Methodist Church in Indianapolis, could have attended DePauw had they not won Rector scholarships, Hamilton says. He figures he would have gone somewhere – he was heavily recruited for his athletic prowess – but DePauw was the right choice, he says. Having been a basketball standout, graduates from DePauw. Attends Goethe University in Germany and travels across Europe, sparking his interest in international affairs. Attends law school at Indiana University. Practices law in Columbus, Ind. Elected to Congress in November 1964. 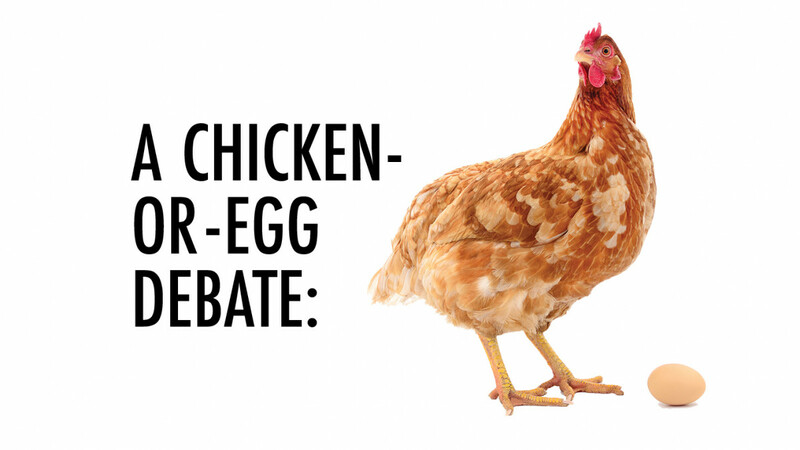 Serves as a member of the U.S. House of Representatives. Works as director of the Woodrow Wilson International Center for Scholars. Works in various capacities at Indiana University. Leads numerous commissions. Is awarded the Presidential Medal of Freedom by President Obama. Has his name and that of former U.S. Sen. Richard Lugar added to IU’s School of Global and International Studies. His father, Jabir Murat Ejupi, was an Albanian shepherd dubbed “John Murad” when he passed through Ellis Island in 1913. His mother, Henrietta, 17, ran away from home to marry a man 22 years her senior. Together they raised three boys in a four-room apartment behind John’s Restaurant, their Whiting, Ind., business. And their eldest son, who washed dishes, waited tables and managed the cash register, would grow up to be a physician and Ph.D. pharmacologist who would win the Nobel Prize for his far-reaching contributions to medical science. 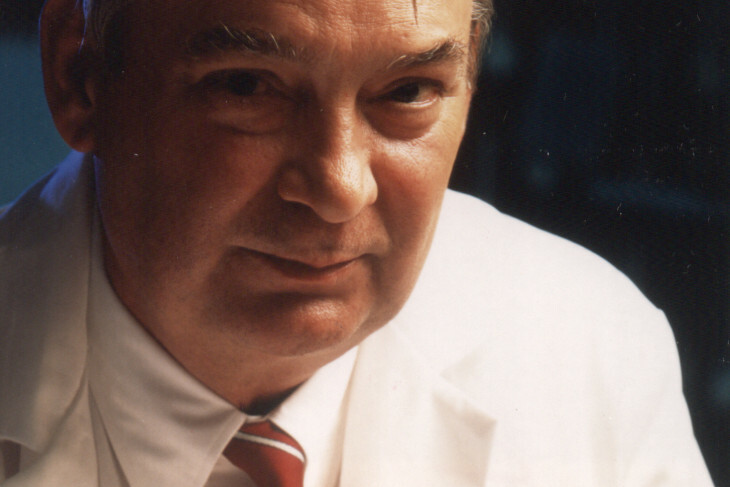 Ferid Murad ’58 knew from the time he was 12 that he wanted to be a doctor. He also wanted an extensive education “so I wouldn’t have to work as hard as my parents,” he wrote in an autobiography for the Nobel Foundation. The first two wishes came true; the third one, not so much. At age 82 – 20 years after winning the Nobel – he is still working, he says, so he may “work with talented people, talented trainees, talented professors.” He is motivated to continue research “to answer questions that have never been answered before.” His life’s work – the study of nitric oxide’s function as a hormone that signals certain activities in the body – has had a profound effect on medicine. A Rector Scholarship launched Murad’s career. His family couldn’t afford college, so he considered military academies and other universities offering scholarships to ease the financial burden. A high school teacher who had graduated from DePauw suggested he take a look. “The combination of good science training plus the liberal arts training was appealing,” Murad says. He conducted undergrad research with biology professor Forst Fuller ’38, who encouraged Murad – who by then was contemplating next steps – to consider the M.D./Ph.D. program Western Reserve University (now Case-Western) had just created. Thus began what was, by his own accounting, an exceptionally long period – 12 years after graduation from DePauw – during which he earned his doctoral degrees and trained in clinical medicine at Massachusetts General Hospital and in research and clinical medicine at the National Institutes of Health. He was first in his class every year in medical and graduate school. 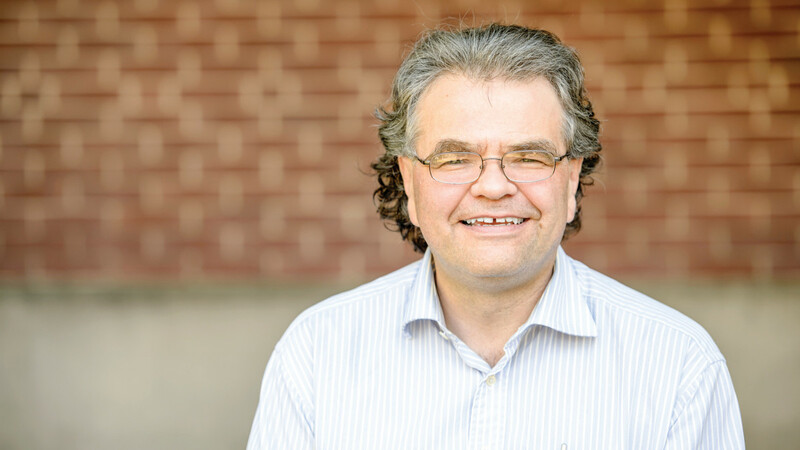 Over the ensuing years, Murad has had a series of university and private-sector positions that have enabled him to conduct research, teach and practice medicine. 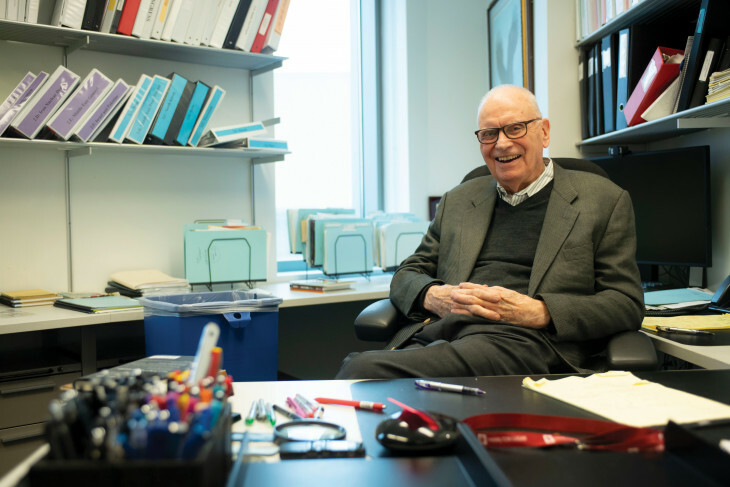 A year before winning the Nobel, he joined the University of Texas-Houston to be the first chairman of its combined science department; he later moved first to George Washington University and then Stanford University, where he works now. 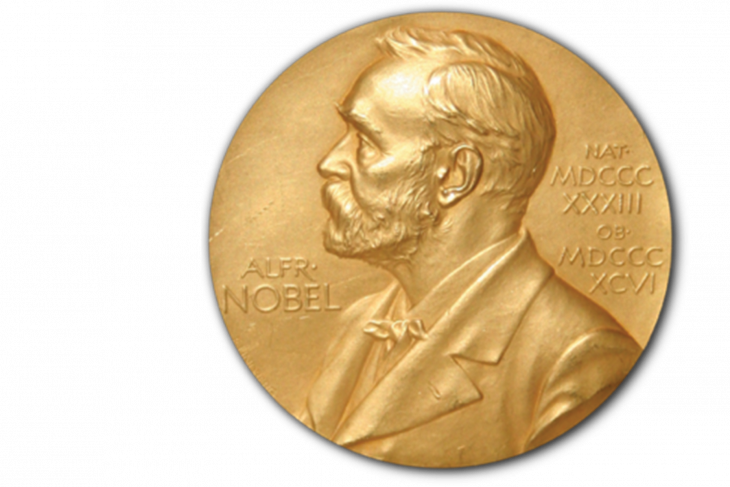 As a Nobel laureate, Murad has been swamped with invitations from around the world. He received so many from elementary and high schools that he simplified his research in a video aimed at children. He has visited 80 countries and has met about 15 presidents, kings, queens and other leaders, including Presidents Bill Clinton and George W. Bush. And yet, one of the most memorable events, he wrote in his Nobel bio, brought him back home to Indiana, where he was grand marshal of the Whiting July 4 parade. Serves internship and residency at Massachusetts General Hospital. 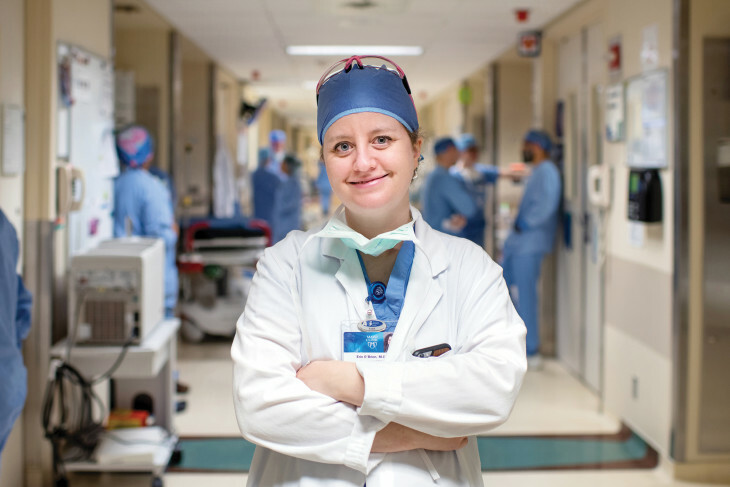 Works as a clinical associate in the Heart Institute at the National Institutes of Health. Develops a clinical pharmacology division at the University of Virginia School of Medicine. Works as chief of medicine at Palo Alto Veterans Hospital, a Stanford University-affiliated facility. Serves two years as acting chairman of medicine. Works as vice president at Abbott Laboratories. Founds and runs a biotech company, Molecular Geriatrics Corp. Serves as the first chairman of University of Texas-Houston’s new combined basic science department. Later takes on a second role as director of the Institute of Molecular Medicine. Wins the Nobel Prize for Physiology/Medicine. Teaches and conducts research at George Washington University. Returns to Stanford to teach and conduct research. 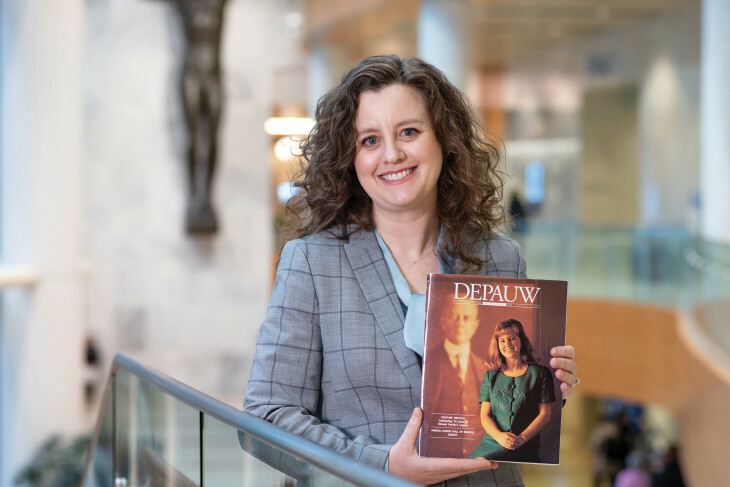 Editor's note: To celebrate the Rector Scholarship's 100th anniversary, the names of all Rector scholars who appear in this issue of DePauw Magazine have been bolded.